“The dream has become a reality.” These words by Victor Manuel Villalobos Arambula, Secretary of Agriculture and Rural Development of Mexico, summed up the sentiment felt among the attendees at the International Maize and Wheat Improvement Center (CIMMYT) Global Wheat Program Visitors’ Week in Ciudad Obregon, Sonora. 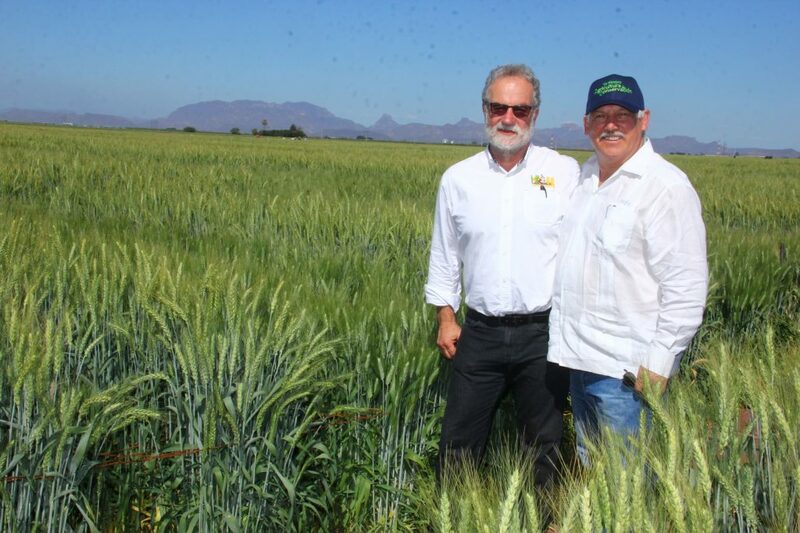 In support of the contributions to global and local agricultural programs, Villalobos spoke at the week’s field day, or “Dia de Campo,” in front of more than 200 CIMMYT staff and visitors hailing from more than 40 countries on March 20, 2019. Villalobos recognized the immense work ahead in the realm of food security, but was optimistic that young scientists could carry on the legacy of Norman Borlaug by using the tools and lessons that he left behind. “It is important to multiply our efforts to be able to address and fulfill this tremendous demand on agriculture that we will face in the near future,” he stated. The annual tour at the Campo Experimental Norman E. Borlaug allows the global wheat community to see new wheat varieties, learn about latest research findings, and hold meetings and discussions to collaborate on future research priorities. 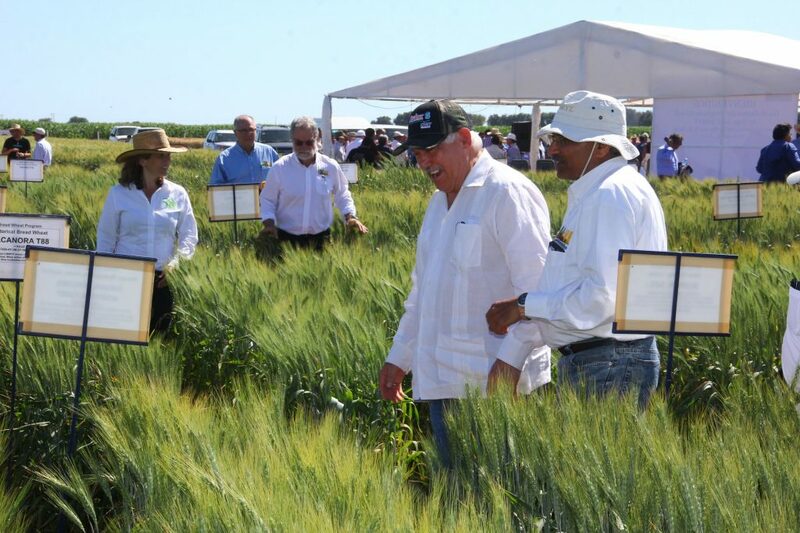 Given the diversity of attendees and CIMMYT’s partnerships, it is no surprise that there were several high-level visits to the field day. The annual tour at the Campo Experimental Norman E. Borlaug allows the global wheat community to see new wheat varieties, learn about latest research findings, and hold meetings and discussions to collaborate on future research priorities. Given the diversity of attendees and CIMMYT’s partnerships, it is no surprise that there were several high-level visits to the field day. A high-level delegation from India, including Balwinder Singh Sidhu, commissioner of agriculture for the state of Punjab, AK Singh, deputy director general for agricultural extension at the Indian Council of Agricultural Research (ICAR), and AS Panwar, director of ICAR’s Indian Institute of Farming Systems Research, joined the tour and presentations. All are longtime CIMMYT collaborators on efforts to scale up and disseminate sustainable intensification and climate smart farming practices. 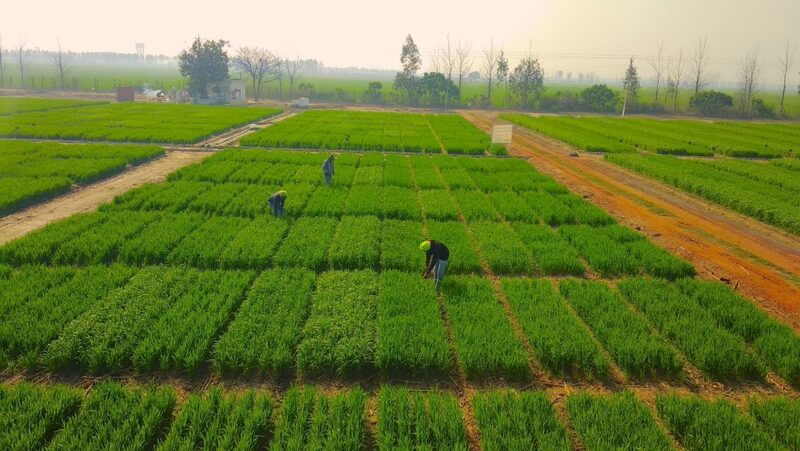 Panwar, who is working with CIMMYT and partners to develop typologies of Indian farming systems to more effectively promote climate smart practices, was particularly interested in the latest progress in biofortification. “One of the main objectives of farming systems is to meet nutrition of the farming family. And these biofortified varieties can be integrated into farming systems,” he said. In addition, a delegation from Tunisia, including dignitaries from Tunisia’s National Institute of Field Crops (INGC), signed a memorandum of understanding with CIMMYT officials to promote cooperation in research and development through exchange visits, consultations and joint studies in areas of mutual interest such as the diversification of production systems. INGC, which conducts research and development, training and dissemination of innovation in field crops, is already a strong partner in the CGIAR Research Program on Wheat (WHEAT)’s Precision Phenotyping Platform for Wheat Septoria leaf blight. At the close of the field day, CIMMYT wheat scientist Carolina Rivera was honored as one of the six recipients of the annual Jeanie Borlaug Laube Women in Triticum (WIT) Early Career Award. The award offers professional development opportunities for women working in wheat. “Collectively, these scientists are emerging as leaders across the wheat community,” said Maricelis Acevedo, Associate Director for Science for Cornell University’s Delivering Genetic Gain in Wheat Project, who announced Rivera’s award. WHEAT and Global Wheat Program Director Hans Braun also took the opportunity to honor and thank three departing CIMMYT wheat scientists. Carlos Guzman, head of wheat nutrition and quality, Mohammad Reza Jalal Kamali, CIMMYT country representative in Iran, and Alexey Morgounov, head of the International Winter Wheat Improvement Program received Yaquis, or statues of a Yaqui Indian. The figure of the Yaqui Indian is a Sonoran symbol of beauty and the gifts of the natural world, and the highest recognition given by the Global Wheat Program. 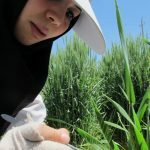 This article by Vanessa Meadu was originally posted on March 21, 2019 on cimmyt.org. India’s northwest region is the most important production area for two staple cereals: rice and wheat. But a growing population and demand for food, inefficient flood-based irrigation, and climate change are putting enormous stress on the region’s groundwater supplies. 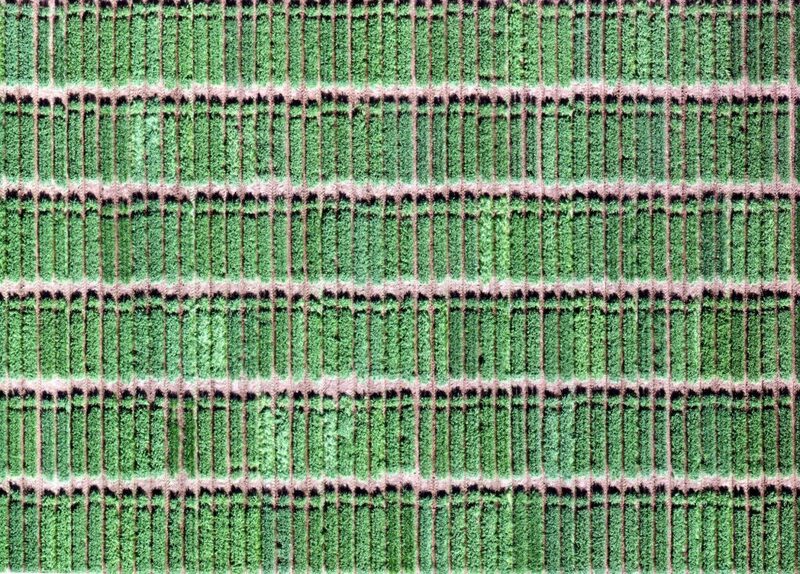 Science has now confronted this challenge: a “breakthrough” study demonstrates how rice and wheat can be grown using 40 percent less water, through an innovative combination of existing irrigation and cropping techniques. 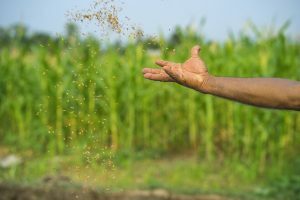 The study’s authors, from the International Maize and Wheat Improvement Center (CIMMYT), the Borlaug Institute for South Asia (BISA), Punjab Agricultural University and Thapar University, claim farmers can grow similar or better yields than conventional growing methods, and still make a profit. The researchers tested a range of existing solutions to determine the optimal mix of approaches that will help farmers save water and money. 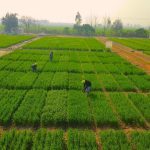 They found that rice and wheat grown using a “sub-surface drip fertigation system” combined with conservation agriculture approaches used at least 40 percent less water and needed 20 percent less Nitrogen-based fertilizer, for the same amount of yields under flood irrigation, and still be cost-effective for farmers. Sub-surface drip fertigation systems involve belowground pipes that deliver precise doses of water and fertilizer directly to the plant’s root zone, avoiding evaporation from the soil. The proposed system can work for both rice and wheat crops without the need to adjust pipes between rotations, saving money and labor. But a transition to more efficient approaches will require new policies and incentives, say the authors. Innovative irrigation system could future-proof India’s major cereals. Thomsom Reuters Foundation News, 20 March 2019. 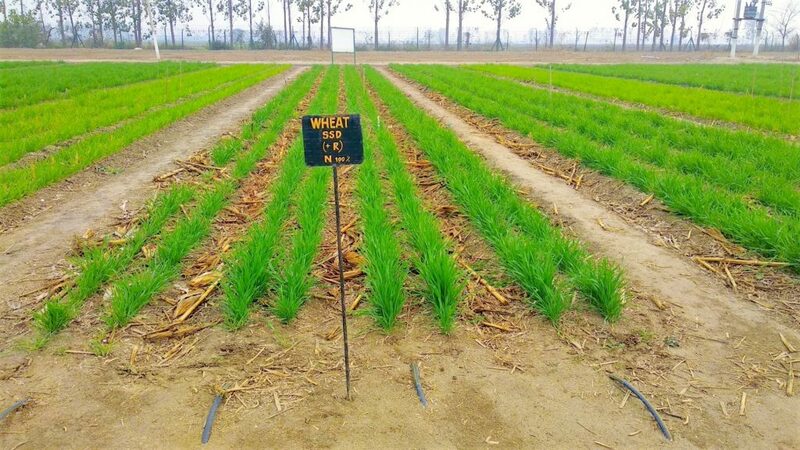 The study received funding from the CGIAR Research Program on Wheat (WHEAT), the Indian Council of Agricultural Research (ICAR) and the Government of Punjab. The authors acknowledge the contributions of the field staff at BISA and CIMMYT based at Ludhiana, Punjab state. 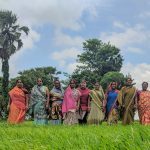 Self-help groups in Bihar, India, are putting thousands of rural women in touch with agricultural innovations, including mechanization and sustainable intensification, that save time, money, and critical resources such as soil and water, benefiting households and the environment. The Bihar Rural Livelihoods Promotion Society, locally known as Jeevika, has partnered with the Cereal Systems Initiative for South Asia (CSISA), led by the International Maize and Wheat Improvement Center (CIMMYT), to train women’s self-help groups and other stakeholders in practices such as zero tillage, early sowing of wheat, direct-seeded rice and community nurseries. An autonomous body under the Bihar Department of Rural Development, Jeevika is also helping women to obtain specialized equipment for zero tillage and for the mechanized transplanting of rice seedlings into paddies, which reduces women’s hard labor of hand transplanting. With more than 100 million inhabitants and over 1,000 persons per square kilometer, Bihar is India’s most densely-populated state. Nearly 90 percent of its people live in rural areas and agriculture is the main occupation. 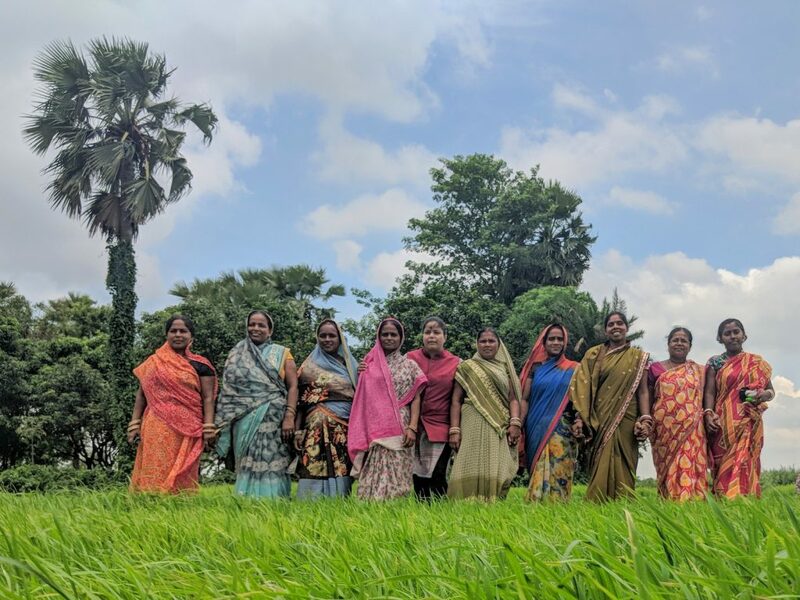 Women in Bihar play key roles in agriculture, weeding, harvesting, threshing, and milling crops, in addition to their household chores and bearing and caring for children, but they often lack access to training, vital information, or strategic technology. Like all farmers in South Asia, they also face risks from rising temperatures, variable rainfall, resource degradation, and financial constraints. Jeevika has formed more than 700,000 self-help groups in Bihar, mobilizing nearly 8.4 million poor households, 25,000 village organizations, and 318 cluster-level federations in all 38 districts of Bihar. The organization also fosters access for women to “custom-hiring” businesses, which own the specialized implement for practices such as zero tillage and will sow or perform other mechanized services for farmers at a cost. “Custom hiring centers help farmers save time in sowing, harvesting and threshing,” said Anil Kumar, Program Manager, Jeevika. The staff training, knowledge and tools shared by CSISA have been immensely helpful in strengthening the capacity of women farmers, according to Dr. D. Balamurugan, CEO, Jeevika. “We aim to further strengthen our partnership with CSISA and accelerate our work with women farmers, improving their productivity while saving their time and costs,” Balamurugan said. CSISA is implemented jointly by the International Maize and Wheat Improvement Center (CIMMYT), the International Food Policy Research Institute (IFPRI) and the International Rice Research Institute (IRRI). It is funded by the Bill & Melinda Gates Foundation and the United States Agency for International Development (USAID). This article was originally published on the website of the International Maize and Wheat Improvement Center on March 7, 2019. For plant scientists, increasing wheat yield potential is one of the most prevalent challenges of their work. 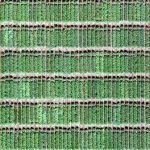 One key strategy for increasing yield is to improve the plant’s ability to produce biomass through optimizing the conversion of solar radiation into plant structures and grain, called radiation use efficiency (RUE). Currently, the process is 30-50% less efficient in wheat than in maize. International Maize and Wheat Improvement Center (CIMMYT) wheat physiologist Gemma Molero, in collaboration with Ryan Joynson and Anthony Hall of the Earlham Institute, has been studying the association of RUE related traits with molecular markers to identify specific genes associated with this trait. In December 2018, her team published their results in the article “Elucidating the genetic basis of biomass accumulation and radiation use efficiency in spring wheat and its role in yield potential,” shedding light on some of the genetic bases of biomass accumulation and RUE in a specially designed panel of lines that included material with diverse expression of RUE over the wheat crop cycle. Over the course of two years, Molero and fellow researchers evaluated a panel of 150 elite spring wheat genotypes for 31 traits, looking for marker traits associated with yield and other “sink”-related traits, such as, grain number, grain weight and harvest index, along with ‘’source’’-related traits, such as RUE and biomass at various growth stages. 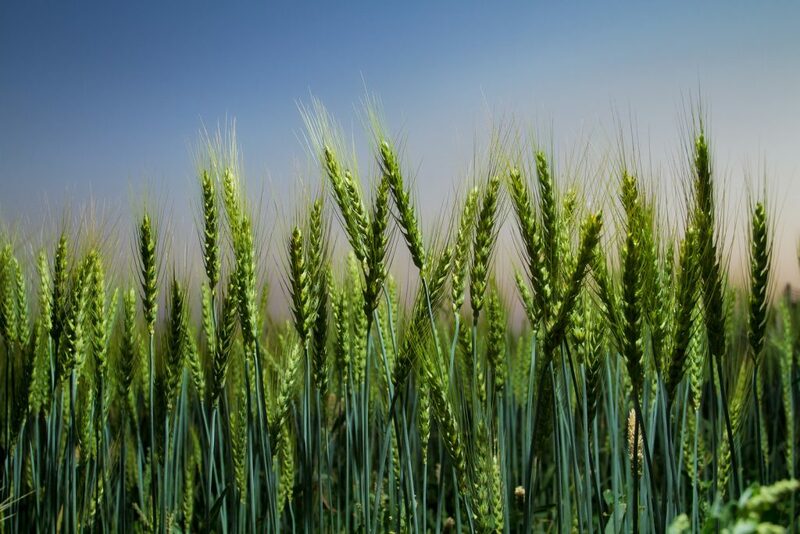 Many of the elite wheat lines that were tested encompass “exotic” material in their pedigree such as ancient wheat landraces and wheat wild relatives. 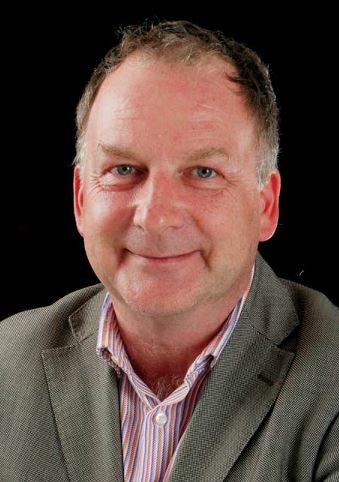 The scientists found that increases in both net rate of photosynthesis and RUE have the potential to make a large impact on wheat biomass, demonstrating that the use of exotic material is a valuable resource to help increase yield potential. This is the first time that a panel of elite wheat lines has been assembled using different sources of yield potential traits, and an important output from a large global endeavor to increase wheat yield, the International Wheat Yield Partnership (IWYP). “We identified common genetic bases for yield, biomass and RUE for the first time. 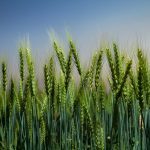 This has important implications for wheat researchers, breeders, geneticists, plant scientists and biologists,” says Molero. The identification of molecular markers associated with the studied traits is a valuable tool for wheat improvement. Broadly speaking, the study opens the door for a series of important biological questions about the role of RUE in yield potential and in the ability to increase grain biomass. In order to accommodate worldwide population increases and shifts in diet, wheat yield needs to double by 2050 — and genetic gains in wheat, specifically, must increase at a rate of 2.4 percent annually. Increasing biomass through the optimization of RUE along the wheat crop cycle can be an important piece in the puzzle to help meet this demand. In celebration of International Women’s Day 2019, Victor Kommerell, Program Manager of the CGIAR Research Programs on MAIZE and WHEAT at the International Maize and Wheat Improvement Center, reflects about International Women’s Day and gender research at CGIAR in a conversation with CGIAR science leaders. See the full article, as well as with videos, interviews and publications from across the CGIAR system on gender research, here. 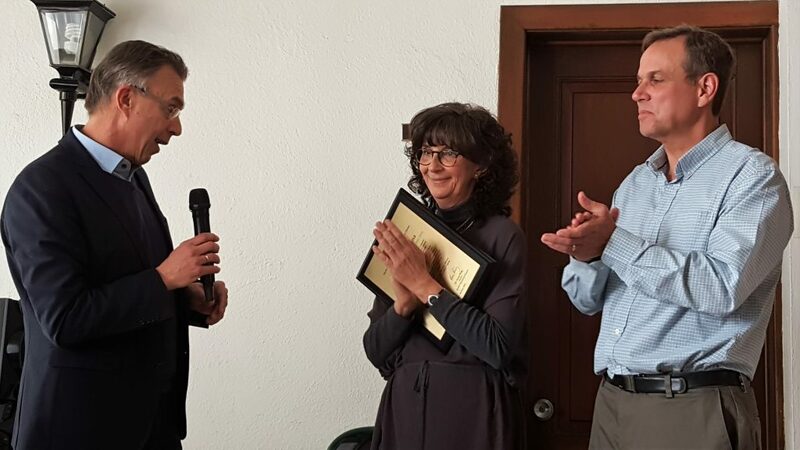 Twenty years flew by for Monica Mezzalama, now former Pathologist and Head of the Seed Health Unit at the International Maize and Wheat Improvement Center (CIMMYT). At the end of January 2019, she made her way back to her hometown of Turin, Italy. Looking back at her tenure, Monica told us she felt “overwhelmed” by the opportunities that CIMMYT has given her. Founded in 1988, the CIMMYT Seed Health Lab began with five employees, eventually expanding to eight people. With Mezzalama at the helm since 2001, the unit has become a crucial part of CIMMYT’s operation in conducting global and national germplasm exchanges. Some would say that seed distribution is the “lifeblood” of CIMMYT. Around the world, CIMMYT is known as a reliable distributor of seeds. According to Mezzalama, this is crucial not only for farmers but for other researchers. Without proper regulatory precautions, one can jeopardize the work of others when handling pathogens that can affect seeds. CIMMYT distributes seed in collaboration with more than 100 countries worldwide, many of which don’t receive support or seed from any other institution. According to Mezzalama, “CIMMYT’s reputation is on the line,” if healthy, quality seed is not delivered. Under Mezzalama’s watch there were never such problems with CIMMYT seeds. According to Mezzalama, “CIMMYT’s reputation is on the line,” if healthy, quality seed is not delivered. Seeds are judged on appearances, and must be good-looking as well as healthy. “Presentation standards are key because genetics aren’t immediately seen when the seeds are delivered,” Mezzalama states. If unattractive seed is discarded, then money is metaphorically being thrown away. Beyond saving money, quality seed control conducted by the Seed Health Unit helps keep data fresh and research up to date. Good seed health depends on leadership like that from Mezzalama. Among the accomplishments of her two-decade tenure at CIMMYT, Monica formed and led a team that has responded quickly and effectively to emerging maize and wheat disease epidemics. In the midst of finding solutions to phytosanitary and biosafety challenges, she also took time to mentor young scientists and colleagues. Monica Mezzalama will be moving on to the University of Turin in Italy to take on a new challenge in the academic world as a professor of Phytopathology. She expressed sadness at leaving CIMMYT, but gratitude at the opportunities CIMMYT has given her to grow professionally and the freedom to explore and experiment within her laboratory. 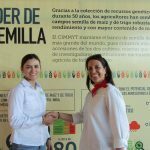 Mezzalama’s work and the team she leaves behind provide a strong base for continued safeguarding of CIMMYT’s international seed distribution efforts under her successor’s leadership. 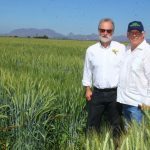 Down the road, Mezzalama hopes to maintain collaboration with CIMMYT in sustainable agricultural efforts. 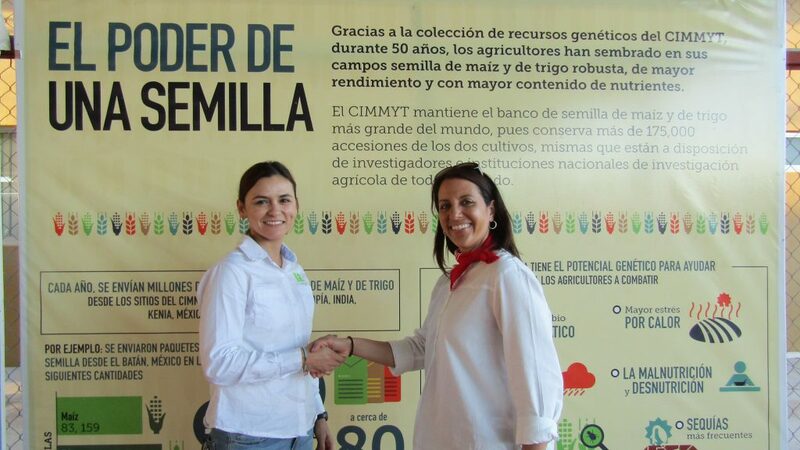 Monica receives a plaque from Director General Martin Kropff recognizing her accomplishments at CIMMYT. How to scale? This question frequently comes up as projects look to expand and replicate results. In order to sustain enduring impacts for projects after their lifetime, agricultural programs are turning to scaling strategies. These strategies look beyond the numbers that are reached within a project and include sustainability and transformation beyond the project context. Methods and tools exist that help anticipate realistic and responsible scaling pathways. Maria Boa recently joined the team as Scaling Coordinator. 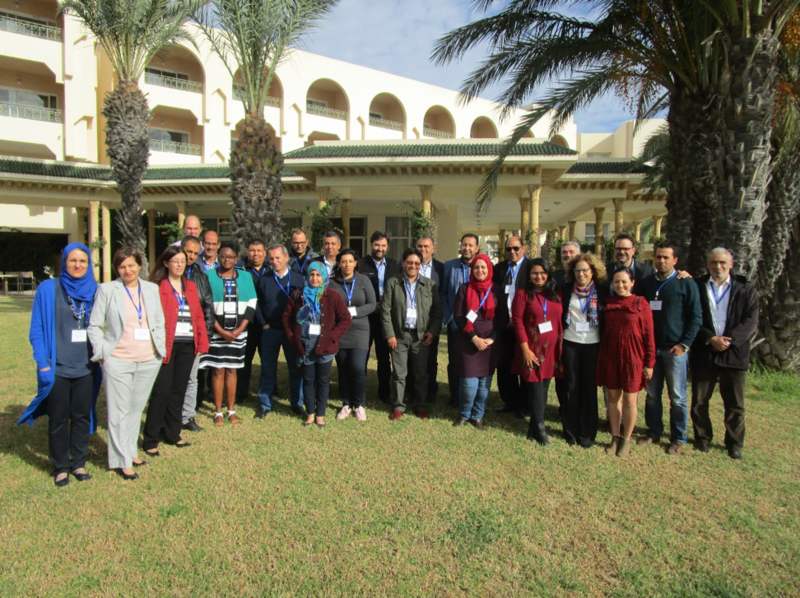 Last year, Boa and Woltering participated in regional meetings on scaling in Morocco, Tunisia and Vietnam, which highlighted the need for better dissemination of information on how to approach scaling, in addition to its benefits. Participants of the Tunisia workshop collaborate on a group exercise. According to Boa, one of the key messages highlighted throughout these events was that in order for scaling to take hold and be integrated into projects, “…there needs to be a shift in mindset to accept that change is complex and that most projects only address a fraction of the problem.” This is essential in using scaling to effectively support long-term results. 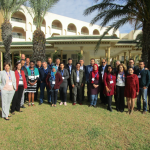 At a workshop in Tunisia organized by ICARDA, IFAD and CIMMYT in November 2018, many participants expressed interest in scaling strategy tools, but were puzzled on how to integrate them into their specific projects. Many determined that they were stuck developing scaling strategies in an outdated framework, or one that strictly focused on using technological innovations. One participant admitted that she was skeptical of scaling perspectives because many did not lie in her field of expertise. The November 2018 CCAFS SEA Conference on Scaling in Vietnam provided a platform for the sharing and learning of experiences in the scaling world. Some of the key messages from the event included the importance of scaling agricultural innovations taking place in complex systems of agricultural transformation, and the necessity of joint cooperation from all involved stakeholders and their openness to taking on challenges as a way to support sustainable system change. According to Boa, scaling is a process that heavily relies on strategic collaboration for lasting impact. “Projects often don’t take into account how they’re a part of a larger chain of potential change,” she says. 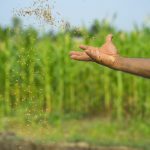 Already recognized as a sustainable leader within scaling, CIMMYT is looking to strengthen scaling efforts in order to foster a more enduring impact within CIMMYT projects and beyond. 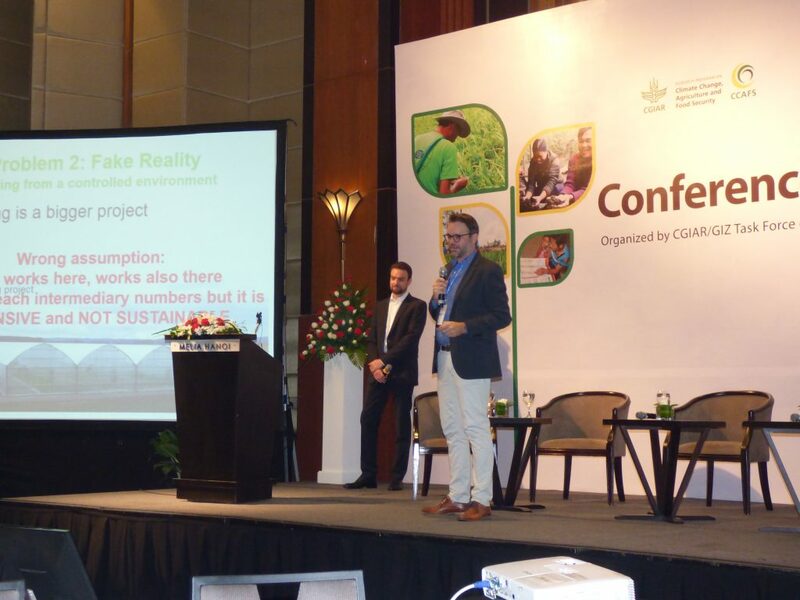 Lennart Woltering presents at the CCAFS SEA Conference in Vietnam. Currently, the Scaling team at CIMMYT is conducting research on the “science of scaling” as it continues to function as a “help desk,” providing support integrating scaling principles in proposals and projects. Its primary role is to consider a project’s scaling needs and guide the development of an informed strategy to leverage efforts and resources. Boa hopes that by integrating responsible scaling approaches early on, projects can better balance the trade-offs associated with change. Success in scaling is measured by a project’s enduring impact. However, stakeholders need more experience and capacity to see programs through to their end and be willing to monitor them beyond that lifespan. CIMMYT is developing and collecting the tools to support stakeholders with these specific capacities. Developing a scaling strategy can also bring additional benefits: a discussion about scaling opens the door for raising awareness and fostering actions among different stakeholders towards system change and sustainable impact. Globally, wheat provides around 20 percent of the calories and protein in human diets. By mid-century, crop production must increase by 60 percent to meet global food demand and help reduce hunger, a challenge made even harder by climate change. 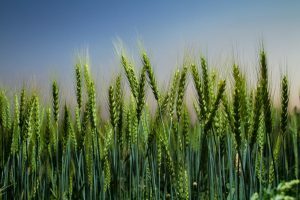 “Climate Change Impact and Adaptation for Wheat Protein,” a study published in Global Change Biology in September 2018, examines why wheat grain protein concentration — a determinant of grain quality — is often overlooked in relation to improving global crop production in the face of climate change challenges. The Access to Seeds Index, an initiative to measure and compare the efforts of global seed companies to enhance the productivity of smallholder farmers, recently released the Access to Seeds Index 2019 for South and Southeast Asia. The Index details what 24 of the leading seed companies are doing—and what they are failing to do—to provide quality seed to smallholder farmers in the region. It is the first time a tool has shed light on how companies are reaching smallholder farmers in the region. Crucial partners for achieving food and nutritional security, seed companies can directly help boost smallholder farmer productivity through the distribution of improved seed. To date, however, they only reach 20 percent of the smallholder farmers in the region. To evaluate the 24 seed companies, the Index uses scorecards to outline the portfolio and strengths of each company. The Index also assesses company performance based on 59 indicators across four categories: commitment, performance, transparency and leadership. The companies who scored highly on the Index are characterized by having sustainable strategies aimed at improving access to seeds for smallholder farmers in the region. In South and Southeast Asia, small-scale farming is the predominate form of agricultural activity. To raise agricultural productivity while simultaneously confronting climate change, seed companies and their shared successes in plant breeding are beneficial, but only when they reach smallholder farmers. The Index provides a resource to help close that gap. In the months to come, the Access to Seeds Index will also publish indexes covering global seed industry benchmarks. Read the full Access to Seeds Index 2019 for South and Southeast Asia here.